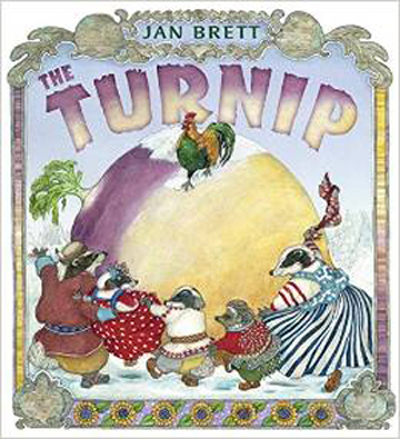 Once again Jan Brett brings an original twist to a favorite folktale. Snow covers the farm in rural Russia as badgers and friends in old-fashioned clothes, and bears marching through bright-colored borders, send young readers laughing from page to page. In 2011, my husband, Joe, and I traveled to Russia. We were driving by a rural farm one day when I was reminded of a gift from a friend. It was a simple carved wooden toy of three people and a bear struggling to pull up a large turnip. The idea of finding a giant turnip really tickled my fancy, and I couldn't stop thinking about it. How could I make my story different from the old Russian tale? I decided to use animal characters. I modeled the badger family after the European badger, with its striking coat and mischievous expression. They were the first to tackle the giant turnip. Other animals would try, but it was the bear in the carved toy that gave me the surprise twist for getting the turnip out of the ground. As I started to write, I had one last thought. 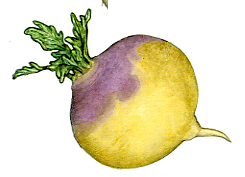 Would readers believe a turnip could be as big as I wanted to make it? I knew someone who grew large pumpkins. Some were over nine hundred pounds. "It could happen," I said to myself.